Mediterranean Waterfront Dream Home. Beautiful bay vistas from every level with hurricane impact windows throughout. Originally built in 1997, it received a TOTAL face lift/expansion in 2011, so it is ready for you to move in and relax - New expanded Kitchen includes upgraded cabinetry, gourmet appliances, large dining room, & beautiful island with granite tops. Other low-maintenance features include new balcony railings, new woodpecker-proof soffits, totally fenced backyard, new pool heater, new air conditioners & more!! Great Room has a beautiful fireplace. Looking for a great party room and/or mother-in-law suite or private guest quarters? Ground level hosts an awesome family and rec area w/massive kitchen, family room, dining area, private bedroom, & bathroom all leading out to custom pool and spa area. 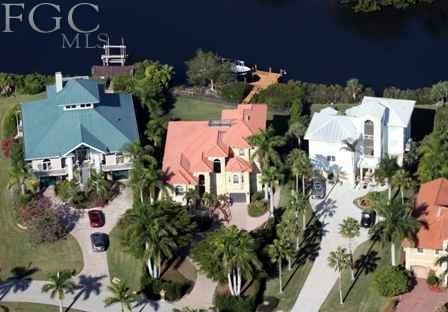 This home has the largest lot in Bayfront. Private dock, boat slip and lift make waterfront living great. At least 281 Trulia users voted on each feature. "its small pleasant clean and lovely friendly neighbors and dog friendly walking distance to restaraunts and stores"
"I work in North Naples. I leave at 7am and come home around 4:30. It’s 18-30 minutes depending on traffic. It’s not a bad commute, unless there’s an accident. I usually avoid I75." "Very safe gated community The residents maintain their homes and yards The location is close to the beach and shopping. Many restaurants are Wii’s short drive golf , tennis and bike riding is popular "
"This neighborhood has slot of older people, they make a lot of rules and aren’t around in the summer"
"Things are very spread out, traffics is pinch the gas slam on the breaks. It’s nice July aug, once October November to many visitors "
"Amazingly quiet. One block from the river and not built up like all the community neighborhoods. Love it here"
"Amazing trails to walk around and the river to to walk along. Great neighbors, and up and coming beautiful neighborhood "
"Friendly and ungated so low fees. Quiet and good access to amenities such as Coconut point, Bonita Village and much more." "My neighborhood is clean and quiet, it’s location is perfect because I have grocery stores nearby. My neighbors are very kind and helpful when there was an emergency like hurricane Irma." "I’ve stayed in Bonita Springs for about 6 years now. Everyone I meet is courteous and friendly. The food here is decent, and shopping centers are extremely close by to where I reside. The beach is only 5 minutes away by car. Can’t beat that!" "Nothing unique. The neighborhood is run down rentals. If I could sell I wood but the value of the home has dropped due to unkept rentals. Landlords don’t care. Rentals have more people living than allowable by code. The town doesn’t care. " "It's a good neighborhood. I love living here I have the beach near me and everything what I need near me. I also have my family around me and I enjoy living close by them. I also have my here close by which makes it easier. " "but I have lived in this neighborhood for 13 years now and it's a beautiful neighborhood. it's very family-oriented there's kids playing outside all the time there's people walking their dogs all the time neighbors are very friendly to each other if you decide to move to Bonita Springs you would love it." "New construction also going on in this community, convenient to Naples and beaches." 209 Bayfront Dr, Bonita Springs, FL 34134 is a 4,323 sqft single-family home built in 1997. This property is not currently available for sale. 209 Bayfront Dr was last sold on Jan 13, 2014 for $2,300,000 (8% lower than the asking price of $2,495,000). The current Trulia Estimate for 209 Bayfront Dr is $2,829,141.